Foam surfboards are a great type of surfboard for getting people into surfing. They’re an ideal beginner surfboard for adults and children alike, being easy to use, fun to learn on and well performing too. Buying a foam surfboard doesn’t mean that you’re buying a board that you’ll only be able to use for a few times then have to upgrade. As foam board technology has improved over the last few years, foam surfboards have developed and are now also suited to intermediate surfers. Don’t get us wrong, if you’re looking to up your surf skill levels and take your surfing more seriously, you’ll probably be looking for an upgrade on a soft board at some point in the future, but if you’re looking for a cheap, fun board to keep you entertained until you feel a hard board is right for you, a foam surfboard is ideal. 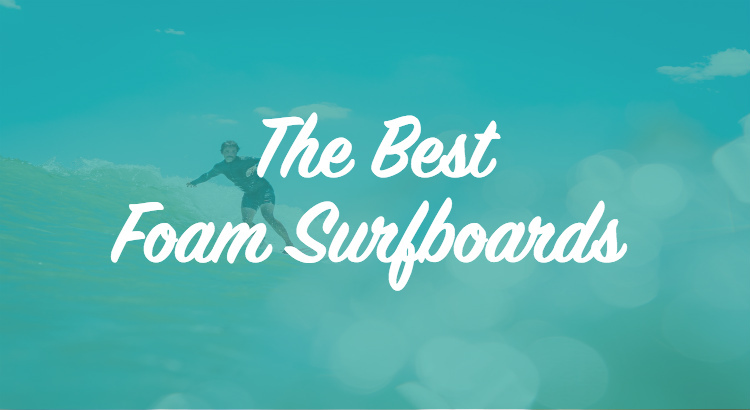 Here we’re going to show you some of the best foam surfboards to buy online. We’ll tell you what makes them a good purchase, talk you through the features and also explain some of the key aspects of foam surfboards. Which Size Foam Surfboard Do I Need? If you’ve read our Best Beginner Surfboards for Adults guide, you might recognise a few of these boards, but don’t switch off, because we’ve included a few more top-end foam surfboards here that are better suited for intermediate surfers. If you’re not sure of what size you’ll need, refer to the size guide on the product description, or check out the sizing table in our beginners guide within the link above. You can use our size guide as a marker, but do bear in mind that because they’re much more buoyant than other surfboards, taller people can ride shorter foamies. If you’re over 6 foot tall, you’d normally be looking at a 9ft footboard, but because of the extra buoyancy offered by foamies, an 8ft board will be okay for you. Unless you’re massive. Generally speaking when it comes to foamies, think 6ft foot for tall children and shorter women, 7ft for women and shorter men and 8ft for men. There are several reasons why we like the Liquid Shredder 70 FSE board. The first is that it perfectly bridges the gap between beginner and intermediate surfing with a durable board. The second is that it has been manufactured to be strong but not too heavy, with a combination of wood and fibreglass stingers (strengthening beams that run through the board), adding to the core strength of the board without being too weighty. The Liquid Shredder 70 FSE is a 7ft board, so is suited to most adults. If you’re looking for something a bit smaller, the board is available in 6ft for children and shorter adults or an 8ft option is there if you’re after a taller board. The colour options available for the 70 FSE are blue, red or yellow. This is Osprey’s highest volume surfboard, so if you’re a tall, heavy guy looking for more stability than other surfboards can offer, this is your board. This board is designed in the Mini Mal shape, so isn’t your standard beginner board, offering more control as your surf skills increase. Available in blue, mint or yellow. The Costway 6ft foamie is a great board for kids (and some adults looking to try a shorter board), that will enable them to learn on and improve their skills as they get more confident. The board features 4 stingers for extra strength and durability, allowing the board to take the extra punishment of falls and learning. Underneath the board you’ll find a hard, slick bottom for more speed and less friction, meaning the board will be fun to use and will get plenty of use at an intermediate level. Available in with red, white or yellow base with blue wave design. This is more a high-quality beginner board than an intermediate board, the Hold Fast Mini Mal foamie comes with a range of features that makes this board ideal for learning on. Suitable for both children and shorter adults up to 70kg in weight the Hold Fast 7th foamie is the perfect board for somebody looking to get into surfing. The board is designed to be easy to stand up on, with a soft surface for more grip and comfort. This also means if you wipe out (which you will) if the board hits you, it won’t hurt or injure you). Our second Osprey foamie features all the benefits of the Osprey board we mentioned previously but with a great wood-style design that was new in 2018. If you’re looking for a great looking board that offers a unique design as well as being packed with features that will help your surf game improve, this is an ideal board. As with all Osprey foamies, this board offers high amounts of buoyancy, enabling you to catch waves and be more stable when surfing. Available in 6, 7 or 8ft sizes, perfect most adults looking to learn how to surfboard. This is a great board for making the step between beginner and a more regular and confident surfer. Suitable for waves up to 5ft tall, the Ignite Vision will provide plenty of fun and value for money for many rides to come. The board features a soft deck and slick bottom to provide both speed when riding and protection if you crash out. The Ignite Vision is a top-end, durable and well-built twin stinger soft board that is available for an affordable, reasonable price. Also available as a 9ft board. Available in a range of sizes, the Blitz soft board is a great option if you’re looking for a board to get the family into surfing. The top of the board features a soft skin to provide more grip underfoot but also be more comfortable to paddle and stand on. The slick material on the bottom of the board allows for more speed and a better ride from the board. Circle One state that this is an ideal progression board, once again allowing you to make the transition from beginner to intermediate with one board. A foam surfboard, commonly known as a foamie, sometimes you’ll hear people call them a softy, is highly popular and common type of surfboard that pretty much every single surfer will own, or will have owned, at one point or another. Foam surfboards have a foam core, which will normally be Expanded Polystyrene (EPS) which makes them much more buoyant than regular surfboards. This makes them easier to control and stand up on, which is why they’re such a popular choice as beginner surfboards. However, many surfers hang onto their foam surfboard even as they progress. Due to the fact they’re easier to control and ride, many surfers who want to ride in rough conditions will use their foam board when the surf is really rough as they allow you to catch waves more easily and you have more control over the board. As well as being easier to ride and control, foam surfboards have soft decks (the top of the board that you stand on). This is why they’re sometimes called softies. The soft deck means that when you crash out, which if you’re a beginner will happen, if the board hits you it won’t hurt or harm you. Again, this is another reason some experienced surfers will use them in rough conditions. There are three main choices of foam within foam surfboards: Polyurethane (PU), Polystyrene (PS) and Expanded Polystyrene (EPS). Here we’ll quickly talk through the differences between the three. This won’t matter too much when it comes to buying a board, but we want you to feel like you know what you’re looking for when buying a foamie. Polyurethane has been a very popular manufacturers choice since the 50s and 60s. Polyurethane is very light, making it beneficial for beginner surfboards as they won’t be heavy or cumbersome, giving you a great sense of control over the board. The downside to polyurethane was that it wasn’t the healthiest of materials to labour with, and it was found to be potentially toxic to those shaping and working with it, so it isn’t really used to mass produce boards any more. Polystyrene is a common material and is much lighter than polyurethane, but takes a lot longer to shape into a surfboard, so polystyrene boards were more expensive than polyurethane because they took longer to make. Although polystyrene isn’t as strong as polyurethane, an epoxy resin is applied to it, making the polystyrene boards much stronger and durable. Light and strong – perfect for beginner surfboards. Expanded Polystyrene, EPS, is the most common type of foam used to make foam surfboards. Expanded Polystyrene is a type of polystyrene that once again is a light material, lighter than both polyurethane and polystyrene. This is why it’s the most popular type of foam for surfboards. So when you see ‘EPS surfboard’ this is what you’re looking at, a strong, light and durable expanded polystyrene board. The foam surfboards are amazing deals for beginners despite of their low life durability the new technology improved its physical condition, design and is also less dense. The foam surfboards are beneficial for surfing learning classes and it helps us to increase the surfing skills before putting it on hard boards.